This has been a discussion going on between some of the great minds in Beatleology-- alright just a group of us on Facebook talking about it. I said that I would post it out on this blog and see what everyone else thinks. This is the John Lennon photo in question. We are trying to figure out when and where it was taken. John wore this jacket and shirt a lot during November of 1980. In lightening the photo, we can make out some of the things in the background. We spot a clock that is at 4:00, a pillar, some luggage and what seems to be a luggage cart. So it would seem that John and Yoko were outside of a hotel in New York City. 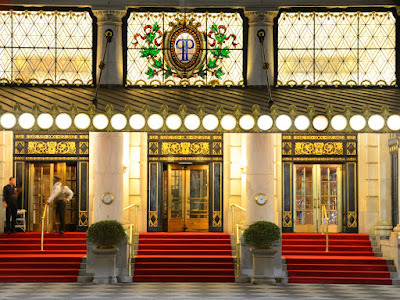 We know that Ringo and John (along with Barbara and Yoko) met at the Plaza Hotel on November 15 (or was it the 26th? Ringo says on the Barbara Walters special that it was on November 15. Other sources say it was November 26. I personally am going to go with Ringo's date on this one, even though Ringo is typically the worst person to trust on dates simply because you don't forget the last day you saw your best friend.). So the mystery question is: Could the John photo have been taken on the same day that he last saw Ringo? It appears to me that John IS at the Plaza in the photo. When I look at a modern photo of the Plaza, I see the round clock on a pillar. The clocks don't seem to match, but I don't know of any other hotel in NYC with clocks like that in the front. Also, the marble on the building appears to match one another on both photos. Was the John photo taken the same day as the Ringo photo? As Miss Tammy points out, the clock is at 4:00. Was that 4pm? John and Ringo supposedly spent the evening together so 4pm would have been early to call it a night. Was it 4am? That would have been way more than just spending the evening together and why would paparazzi be outside a hotel at 4am? Is there another time when John and Yoko were at the Plaza in November of 1980? What do you think my fellow Beatle fans? Yes, it must be the Plaza, some pillar, some lamps behind them (as you can see on other pictures of the hotel, same wall behind them (entry) .... But, oh Miss Tammy, you are a "digital clock"-contemporary :-) - the old-time-clock is at 5.00! The date of meeting Ringo and Barb was Nov. 15th. of course I meant "same pillar, same lamps ..." sorry. If you look at the Promotional video of Starting Over which was made on the same date 26/11/80 John is wearing the same clothes as in the picture here..so its possible Ringo was right with the date..
It’s the old Edwardian Room at the Plaza. The sign above Barb’s head seals it for me. J & R were supposed to have met around Thanksgiving. John’s jacket matches the time frame (pics w/P Goresh & film of J&Y walking in Central Park used in “Woman” video, among other things). Not sure of exact date, but pretty sure someone out there does. More than paparazzi that coul have known about the Stakeys before than the Lennons in the Hotel...what were doing other people out of the Hotel early in the morning? Or could have been 4 P.M. in a dark late Autumn evening? John is wearing his jacket open, maybe late at night he would lace it? I remember meeting Barbara and Ringo when they stayed at the Plaza during the early eighties when I managed the property. I always kept my photo of when I met the Beatles at the Plaza in 1964. Ringo was checking out with Barbara Bach and looked at the picture saying "mate I remember this day" He was a gentleman and autographed it for me. 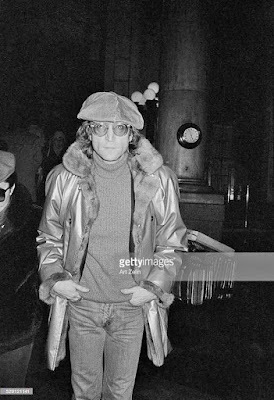 John lived at the Dakota on Central Park West and was still alive at the time.